WHY CHOOSE THREE BY ONE? Turmeric is loved all over the world for its vibrant colour, versatility, & unmistakable flavour. But this spice is so much more than that. It’s no secret that for hundreds of years turmeric has been used in holistic medicine, offering countless uses & multiple health benefits. Turmeric remains a core ingredient in Ayurvedic medicine, & has subsequently made an entrance into the western medical world. Thousands of studies have been published about its health benefits. Made up of a unique chemical profile of which the most important enzyme is curcumin, turmeric is packed full of vitamins, minerals, fibre & phytochemicals (active plant compounds), which provide healing properties for almost every area of our bodies. Turmeric is excellent at fighting illness, destroying diseased cells, & boosting immunity. Its’ compounds also include antioxidants & anti-inflammatory agents, helping us glow from the inside out by aiding our digestive system, helping the skin achieve an optimal level of health, & balancing hormones. 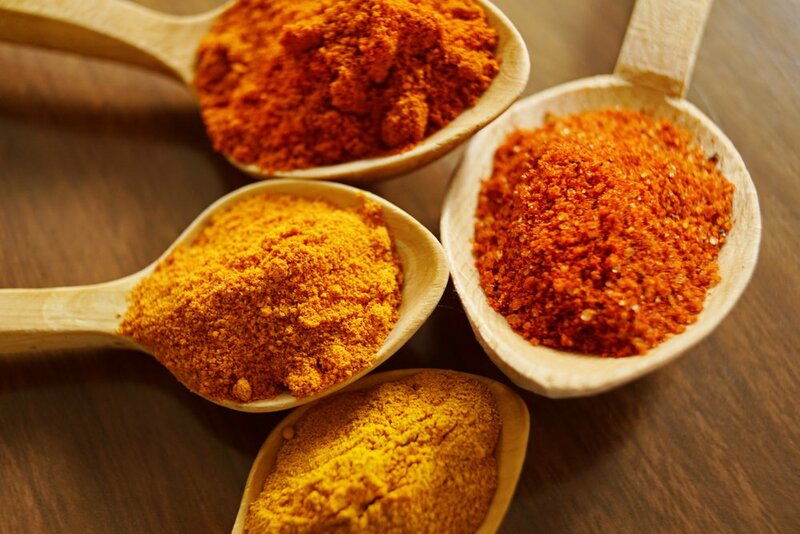 If you want to read more about the role turmeric plays in Ayurvedic medicine, as well as the research & findings in Western medical trials, you can read more here. Sometimes available in its natural state of a whole root, turmeric is more commonly found as a powder, & just one simple teaspoon (500-2,000mg) of the highest quality ground turmeric per day is effective enough. In it’s natural state a turmeric root only contains around 3% curcumin, so if you want to get the best results it’s essential to purchase a high quality turmeric powder. Three By One certified organic turmeric powder has the highest percentage of bioactive curcumin possible (around 8%). Standard supermarket turmeric often only contains around 0.3 to 0.8% curcumin, & also often contains unwanted additives and fillers (often not listed on the ingredients list). One thing you need to be aware of is that turmeric powder has a very low bioavailability, meaning that the intestine struggles to absorb the goodness of curcumin. Combining turmeric with a crack of black pepper can activate its properties and help increase the bioavailability of the curcumin by almost 2000%. So, how can you incorporate a teaspoon of turmeric into your daily diet? Due to its’ mild & mellow flavour it’s actually very easy to add into drinks, dressings, soups, curries. You can make a warming golden milk, add it into muffins, sprinkle on scrambled egg, or make a simple shot drink with honey or maple syrup, lemon juice & a dash of water. One of my favourite ways to use it, while the weather is still cold & grey & the mornings are still dark, is to make an earthy, soul soothing, glow getting turmeric porridge. Put the millet & water in a saucepan over high heat and bring to the boil. Let it simmer for 5 minutes until the millet thickens & there is almost no water left. Add the milk, turmeric, pepper and melted coconut oil and bring to the boil. As soon as it starts to boil, leave the porridge to bubble away until you get a beautiful, creamy, golden porridge. While the porridge is simmering, put the berries, nectar & vanilla into a small saucepan & gently heat. Cook until the berries begin to soften, then mash some of the berries into a sauce, leaving a few berries whole. Ladle the porridge into bowls, top with the warm berries, a dollop of yoghurt, & sprinkle with chopped nuts.